I remember a candidate once presented me page after page of certifications, each in its acetate protector, neatly organized in a faux-leather binder. … Perhaps such binders are common sights in certain industries, but he was applying for a job at a startup and the binder had … the opposite effect than he had hoped. 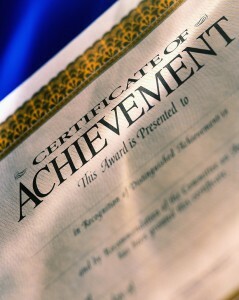 … If someone shows me a technology certification, I suspect they are a technology follower, not a leader. Is ‘certified’ gold? Larry O’Brien, Software Development Times, Feb 2014. The process improvement guys had set up a meeting with us. They wanted our project to implement a few things to help the organization as a whole improve their standing when being assessed for software development maturity. What they didn’t know was that I had once been the one helping other organizations to improve software development maturity. When the meeting started, they outlined the things they wanted us to do. I listened and then started to ask questions. Further, I took issue with some of the things they were asking us to do, and explained instead how the standard was intended to be done based upon my past, successful, experience at getting these practices implemented in a large software development organization. The process improvement director was clearly annoyed. “No,” he said, “you need to do it the way I’m telling you. I know best, because I have the following certifications ….” He then listed off about a half dozen certifications. What we also knew was that he and his team had been unsuccessful for years at improving the software development processes at this Fortune 500 company. This was their latest and greatest attempt to finally make a difference. The only problem was that they clearly, based upon my past experience, still didn’t understand how to do this stuff. They were working purely on a fuzzy classroom understanding of the principles and on top of that were clearly not experienced in the underlying technology of software development. Needless to say, we didn’t come to an agreement on what we would do. I would have happily leveraged his staff and resources to do something that improved our project. I was implementing new approaches on a regular basis and was often getting pushback from other teams on why I’m doing things differently. It would have been great to have a highly visible ally when implementing the next big improvement. Unfortunately, that didn’t happen. Certifications are a great way to keep score when we try to keep ourselves up to date or when learning new technologies. At best I find they are useful at giving people a common vocabulary and some common concepts so we can talk through issues. I’ve never seen the case where getting everyone certified or only hiring certified people has ever made any impact on the performance of an organization. How are you treating certifications within your project team? Humorously and to your point, I become a “consultant” one day by sending out a letter introducing myself as a consultant to several local businesses. Within two days I had my first customer and I have now been in business for over 5 years. Success is driven by results, not certifications. The trick as you say is to show measured results instead of insisting that one’s “certifications” mean they know how to do it. In the case where we are doing something we’ve not done before, then we need to admit to that up front but then lay out why we think our approach should work (ideally based upon similar work that was successful). That doesn’t mean much. Or, it means that you don’t have a clue what is going on. The most important metric to measure is results. Unfortunately, anyone can call themselves a PM or a consultant.